Ayesha Sheeba is best described as a messenger of light. The many gifts and missions she has been entrusted with defines her journey as a soul through many incarnations, some of which have been phenomenal. Yet, the focus here in all of these missions is others and not on her. The Revolution Of Light - the only platform she works through as the Founder and Visionary offers multiple platforms that serve mankind from all walks of life. ROL is focused on one purpose - to empower souls. In many ways. From deep within. 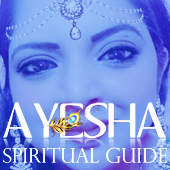 Ayesha began her work as a Spiritual Guide over 20 years ago. And her journey as a gifted soul began as early as since she was just 2 years old. With extraordinary intuition and clairvoyance that has enabled her to communicate and access multiple dimensions in ease since childhood - she has always loved to share her experiences with all. And yet, when faced with intolerance and misunderstood for her abilities, it inspired her instead - to try and analyze her abilities and convey the message in a more practical and comprehensible way. She pursued an unconventional way of life - including in her academics where she refused to conform with the systems of this plane. And yet, her way of defining intelligence has captivated thousands around the world over decades. She launched herself as a corporate trainer for leading multi-national companies and took that as a stepping stone to becoming a researcher in scientific theories such as Quantum Physics and the Chaos Theory which went on to her discovering a unique Scientific Motivational System - The Universal Truth Of Life (www.universaltruthoflife.com). Her mission has since revolved around bringing the deeper concepts of life to the common man. Thus, her many seminars, blogs and articles found their way around the world establishing her as a unique writer and speaker. But that was just the tip of the iceberg. She was always gravitating towards her spiritual abilities as well for it was hard if not impossible to avoid the 'obvious' - which was to clearly see and communicate with the higher dimensions. And her spirit guides, guardian angel and ascended masters kept insisting that she merged her spiritual life with her current work. Hence, she went back to the drawing board and researching on how the supernatural world can in fact become a catalyst for mankind to evolve into their fullest potential by implementing their spiritual gifts and belief system into their lives here. This was soon to become the most thrilling and path breaking discovery thus far. Her journey diversified through Noetic Science ( a scientific approach towards studying the paranormal) and parapsychology. It intensified her need to share her abilities and experiences with thousands around the world from a new perspective. A scientific spiritual system that can empower anyone to becoming a powerful evolving soul. To face life here with much more control over one's abilities and yet conform to a magnificent connection with the Universe. Hence, her journey here continues to serve mankind. In ways that will positively effect and motivate every single person who is open to receiving the message of self-empowerment in a scientific spiritual way. And with every sunrise - comes a new purpose and promise. There will never be enough of wisdom and information. For that is eternal. This journey of hers remains a very humble but powerful message to mankind. Empower yourself.